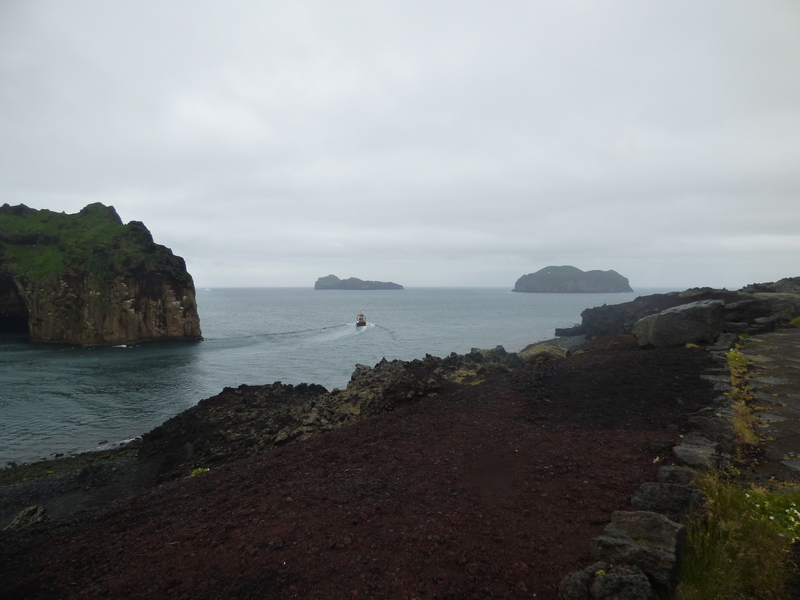 After spending the night in our favorite Airbnb of the trip on Westman Islands, we decided to spend some time exploring the island. 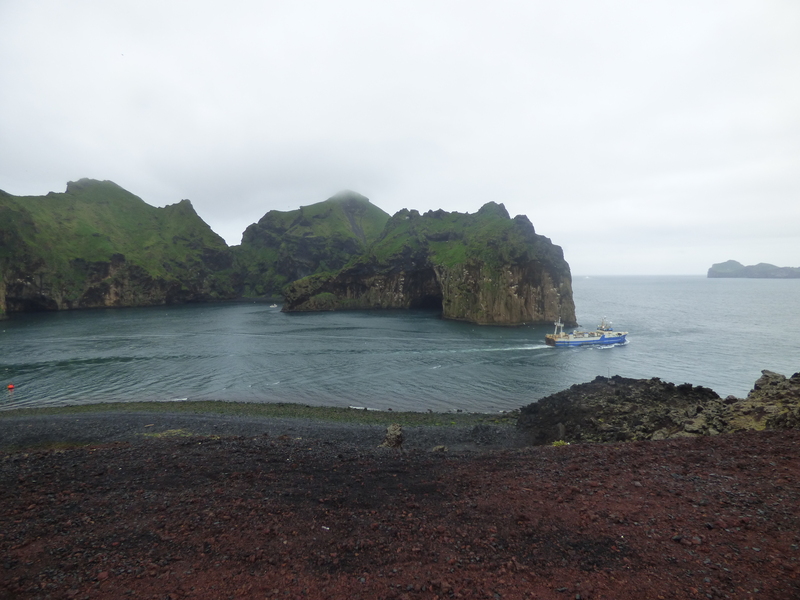 The Westman Islands are a group of islands off the southern coast of Iceland. The main island, which is inhabited, is called Hiemaey, and this is the island we were staying on. After breakfast and a nice conversation with a French couple at our Airbnb, we hiked from there up a small hill, which afforded us views of two of the volcanoes as well as the coast. It was a particularly cold, rainy day, but the beginning of our hike up was a bit milder. The island is quite small, so from this vantage point we could see most of it. We walked a bit farther on, and looked across the way to a couple of smaller islands, which each appeared to have a single house or building. After this short hike, we got in our car and drove to the tip of the island, called Storhofdi. 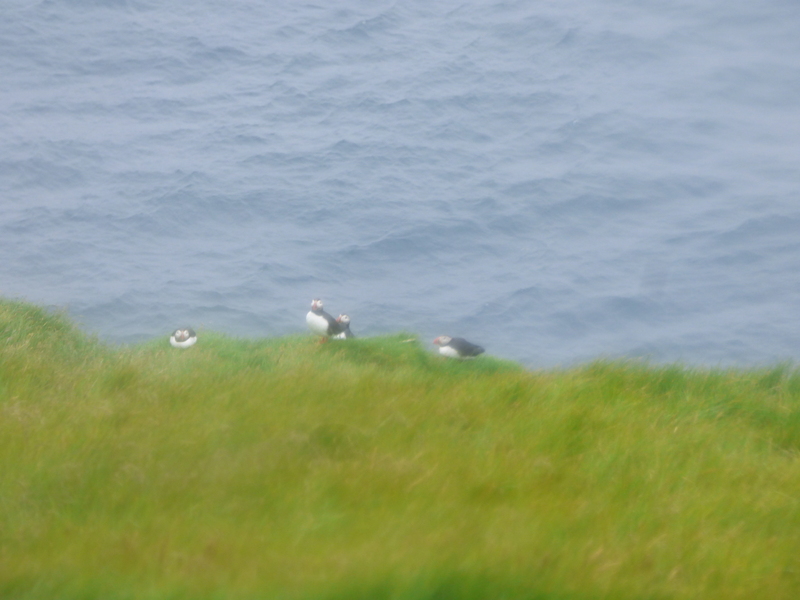 We had been told this was the best place to see the puffins. When we arrived, it was unclear where the paths were and it was also extremely windy and pouring freezing cold rain. 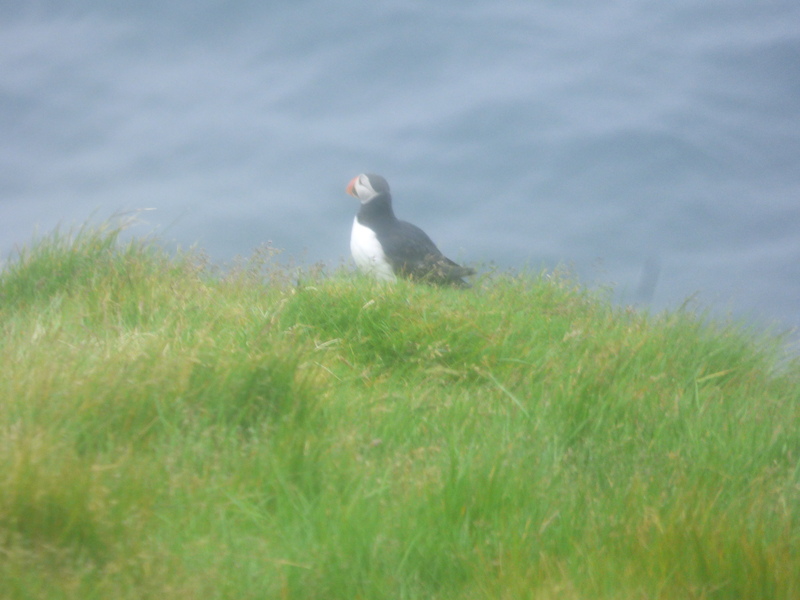 My dad, mom, and brother decided to brave the elements in search of the puffins, but I didn’t have any other warm clothes to change into after, so I remained in the car, nice and warm. 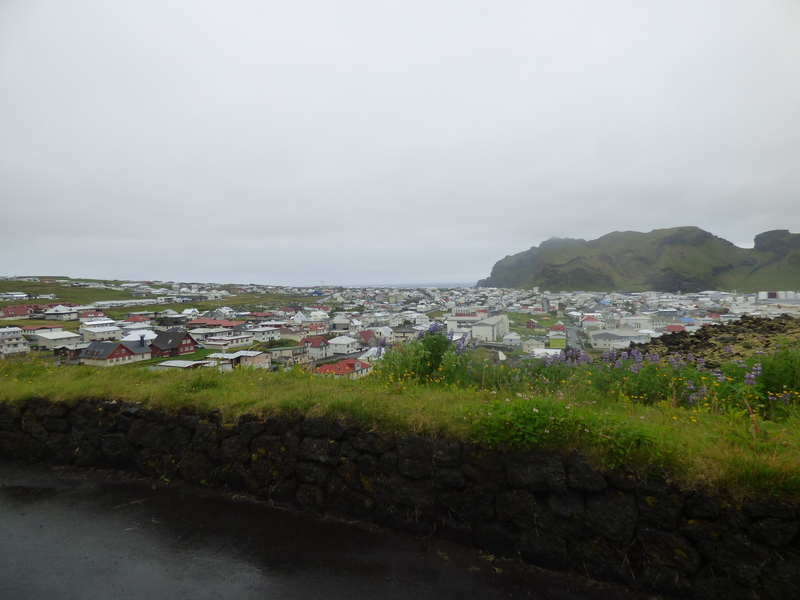 After seeing the puffins, everyone was cold and wet so we drove around the downtown area of Heimaey, trying to find something to do (we had purchased return tickets for later in the afternoon). We saw a museum on the map and decided that would be a good activity for a rainy day, though it did take us a while to actually find the location (the signage wasn’t very clear). We spent a couple of hours at the Sagnheimar Folk Museum, which told about the history of the island and several historic events that took place there. Some of the exhibits included the Algerian pirate raid of 1627 during which over 200 islanders were kidnapped and sold into slavery, the volcanic eruption on Heimaey in 1973, the importance of women on the island, The Festival, an annual celebration that has been held nearly every year since 1874, and a large exhibit about the fishing industry. I thought the exhibit about fishing was very interesting as well as informative. 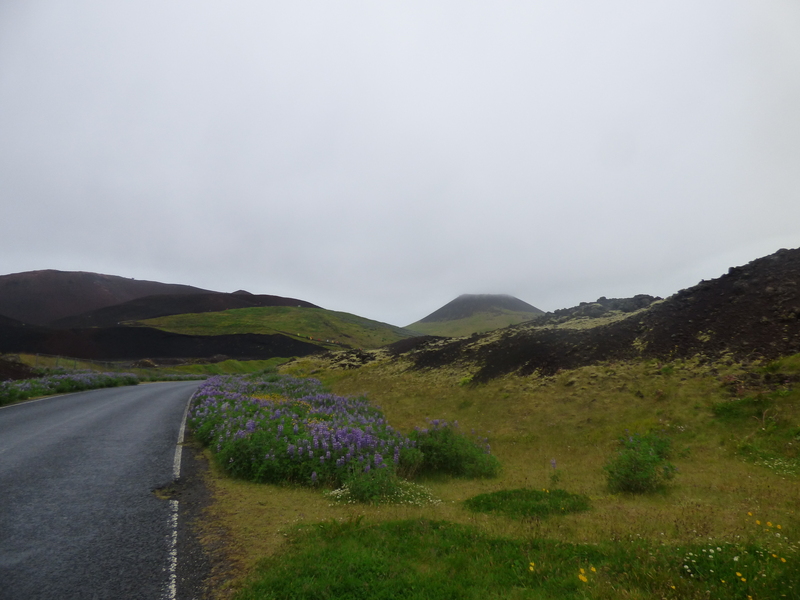 After taking the ferry back over from Westman Islands, we headed to Reykjavik, the capital city of Iceland. 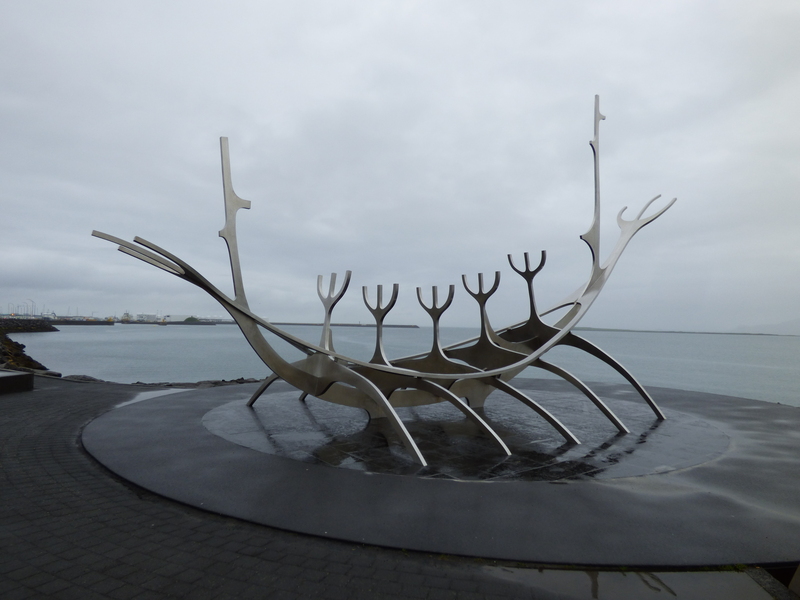 While many visitors spend at least a day in Reykjavik, we were more interested in seeing the rest of Iceland, so we only spent a couple of hours in the city. It was dinner time by this point, so we walked along Laugavegur Street, which is full of interesting shops and restaurants. It is a gorgeous street, and there were many places to eat, but we settled on a pizza place since it was one of the less expensive options. 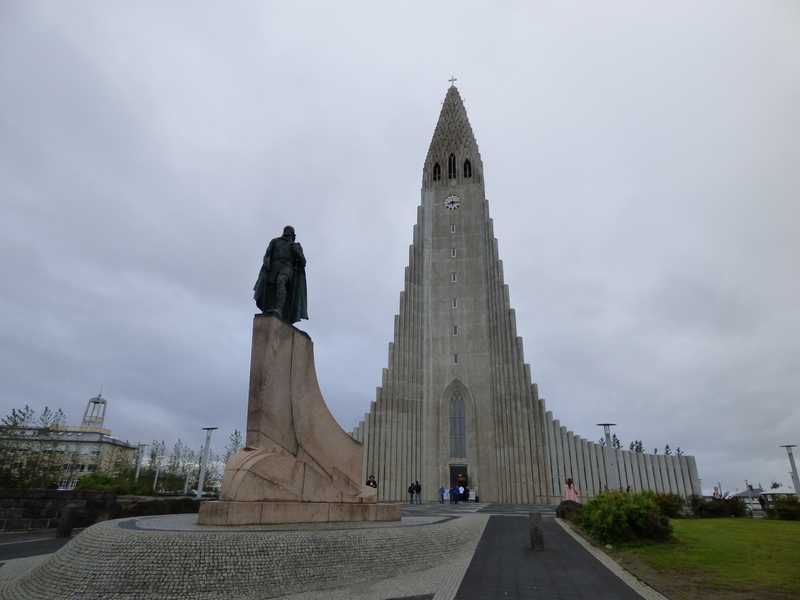 After we ate, we visited Hallgrimskirkja Church, which is visible from nearly everywhere in the city. Its design was inspired by the shapes and forms created when lava cools into basalt rock and it was built from 1945 to 1986. 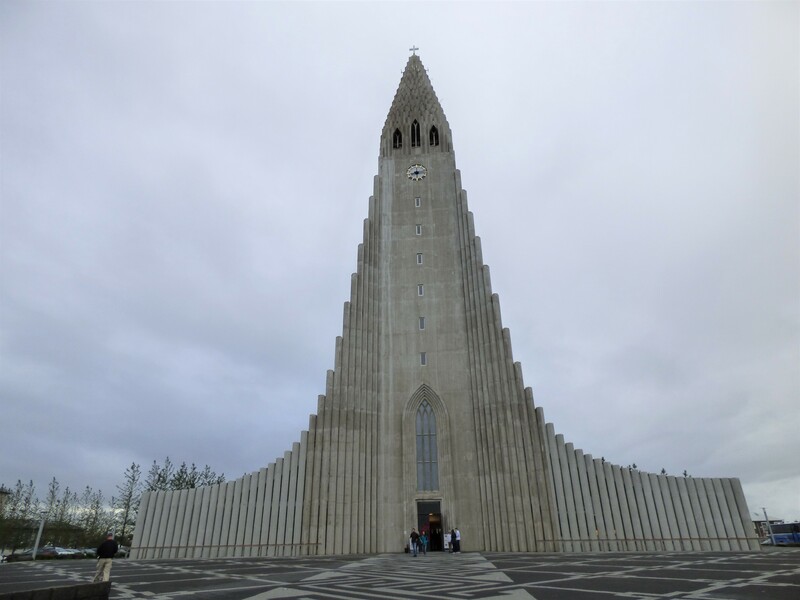 Inside, it has an enormous organ and in front of the church is a large statue of Leifur Eiriksson (970-1020 AD), who was the first European to discover America in the year 1000 AD. We walked around outside and then sat inside for a while. 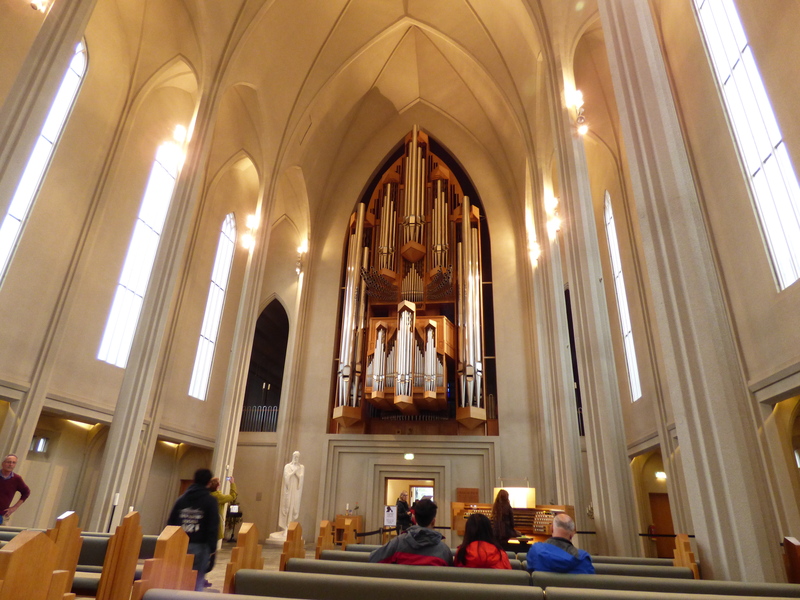 The organist was practicing, so we were able to listen to the organ being played. 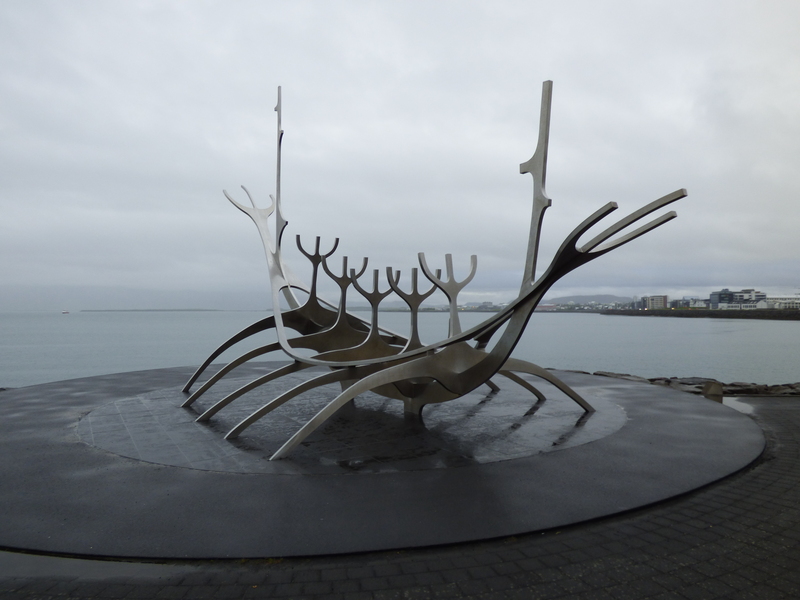 Before heading out, we drove by the Sun Voyager sculpture, which is called Solfar in Icelandic. This massive steel sculpture is found along the coast with views of the ocean beyond, and was revealed in 1990. The artist, Jon Gunnar Arnason, said that is both a dream boat and an ode to the sun. It is certainly a gorgeous sculpture. Costs: The Sagnheimar Museum was 1000 ISK per person (it’s free for anyone under 18). I think our meal in Reykjavik was around $40 USD for two pizzas. All other meals we packed. As with anywhere in Icleand, come prepared with warm and water-proof clothes. 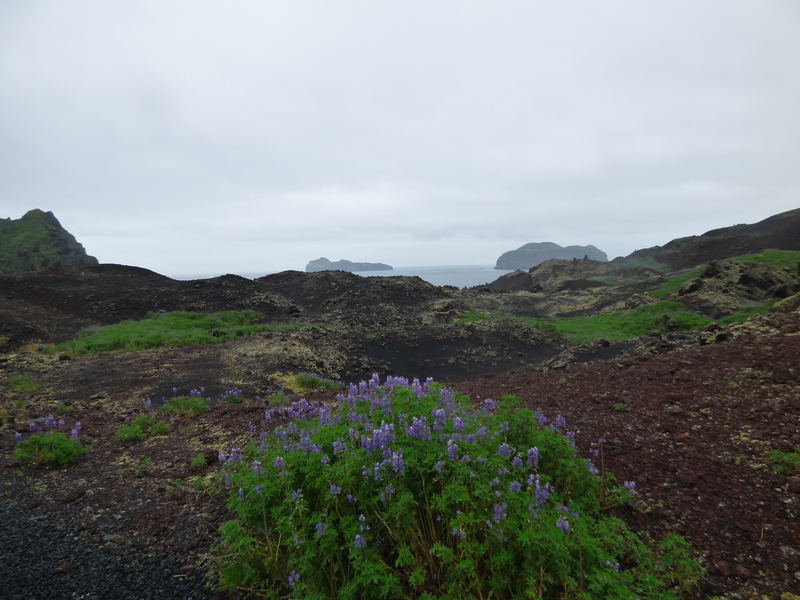 This was the rainiest part of our trip, but Storhofdi, the tip of Heimaey Island, is also one of the windiest places in the northern hemisphere, so be aware of that. While you can certainly spend a day or two in Reykjavik, we saw most of the things we really wanted to see in a matter of a couple of hours. I would have liked to explore a bit more, but my family wasn’t as interested. 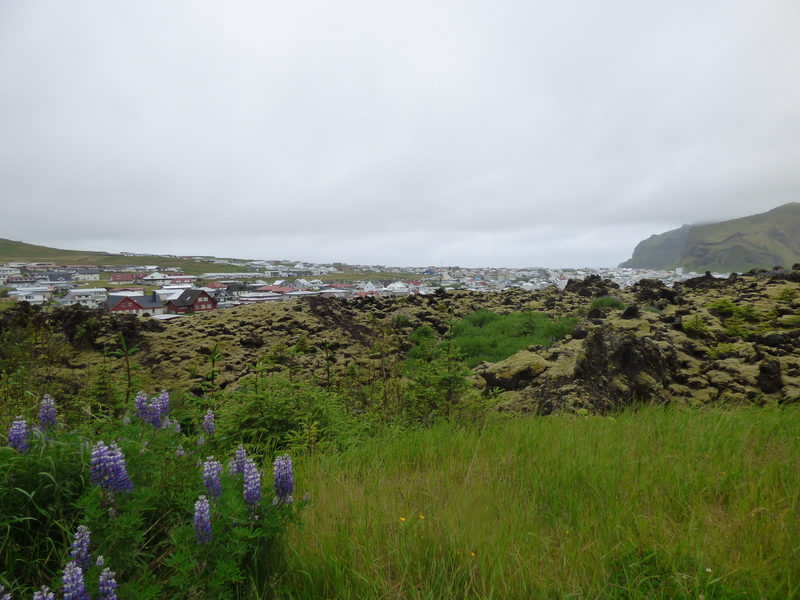 Lower costs dramatically when in Iceland by making your own meals and packing simple lunches. We ate peanut butter and jelly sandwiches every single lunch of our trip, and while not the most appetizing meal to eat so many times in a row, it helped bring the cost of our trip down significantly. Food, especially at restaurants, is extremely expensive in Iceland! So that wraps up our time in Iceland! We flew out the following day after a lazy morning and short walk along the coastline. We really enjoyed our trip (though my mom thought it was rather cold and rainy)! Thank you for such an interesting travel log of your trip to this beautiful area. I have loved reading your blog over the last couple years to an area I will probably be lucky enough to ever visit.